Whenever a manual-winding watch does anything more than tell the time, it's called a "complication". An automatic watch has a complication because it's will automatically wind itself. A chronograph is a complication because of the stop-start-reset function that is added on. Adding the day of the week or the day of the month, are two additional complications. Needless to say, some complications are more "complicated" than others - and when you add several of them together, you get something really complicated. 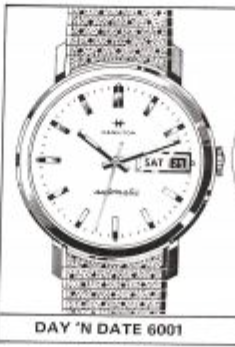 Hamilton's first calendar complication was introduced in 1953, along with their first automatic models, as part of the Hamilton Illinois line. However, the first models to have a day of the week complication weren't introduced until the early 1970's, in a model line called Day'N Date. One of the first Day'N Dates was the 1971 Day' N Date 6001. It was produced for two years. The Day'N Date 6001 came in a 10K RGP one-piece case and retailed for an even $100. I think the model is a good metaphor for the time it was produced. It's a very traditional looking watch produced alongside models that rejected age-old design aesthetics, like the Accumatic A-517, in favor of a new funky and chunky theme. Tucked inside in an ETA-based Hamilton 826 - a 17 jewel automatic grade that is not too dissimilar to what is in modern Hamiltons today (although there are certainly some significant differences). I recently scored a Day'n Date 6001 for a decent price because it was missing it's stem and crown. It came with it's original bracelet along with it's inner and outer boxes too. Other than some scratches to the crystal and the missing crown, it was in very nice shape. The case is very thick - especially considering the styling of the Thin-o-matics that had been around for a decade or longer. The stem tube had been crimped down a smidge so I had to work it a little to get to be round again. Looking at the back of the movement, you can tell that this is an ETA movement by the shape of the rotor. The rotor carrier is attached with two blue screws... a detail you will see on todays ETA movements too. This is also one of the rare situations where the movement-side of the two piece stem is the male side. Most times the male side is attached to the crown. Another "modern" feature is the dial feet are secured to the movement using u-shaped levers that are hinged at one end and, when pressed in, will bear against the dial foot using the other side of the U. With the dial removed, this is the point where you take a deep breath and wonder, "how does this come apart and will I be able to get it back together again". Now you can see why these are called complications. The day wheel just slips up, along with the hour wheel beneath it. That leaves what looks a lot like the ETA-based date models you've seen me do like the Dateline S-575. I re-oriented the photo so the stem is at the right side of the photo. This looks like familiar territory, with the exception of the additional parts on the right side from about the 19 to the 23. Those parts help you to set the day and date. Removing the date wheel is initiated by removing the index and cover on the left side, near the 6, 7 and 8. You can see a screw head that secures a small cover. Under that cover is lever that engages the teeth on the date wheel to align it squarely (so it shows up correctly in the dial window). The lever is very small and it's held in place with a spring that will disappear if you're not extremely careful. Removing the date wheel allows access to remove the other parts on the stem-side of the main plate. Well, the dial-slide of the main plate now looks like your garden-variety manual winding movement like an ETA 688. The rotor comes off the back side easy enough - just the two blue screws hold the carrier on and a single screw (from the other side) will remove the rotor from the carrier. With the rotor out of the way, I've already removed the ratchet wheel from the barrel arbor. This is now very familiar territory, as the rest of the disassembly is just like the other ETA movements I've done. With all the parts set out and ready to be cleaned, I have to admit that I'm crossing my fingers that I don't lose anything before I get it all back together. The movement is cleaned and oiled and back to running away. These "modern" ETA's have a faster beat rate than the pre-1970 vintage models. Rather than beating 5 times per second, this one does 6 beats per second, or 21,600 beats per hour. Modern Hamiltons typically have a 28.8K BPH rate, or 8 beats per second. It's running a smidge fast but the amplitude and beat error are great. I can slow it down slightly. I'll leave it running like this... pretty much spot on. A new crown is needed and I need to fit a female stem to go into it. It has to be just the right length in order engage the male-portion in the movement. Well, it all came together and I'm proud to say this was my first Day'N Date overhaul. I reassembled the front of the movement in my photography light tent - as I was sure I'd lose the tiny spring for the index lever. I'm glad I used the light tent, because the little spring did fly off twice - but it was easy to find inside the white tent. I would have spent 30 minutes on the floor of my workshop if I had done it on my bench. Here's the finished project back in it's original box. It's a nice looking watch, even better than my camera makes it out to be. Nice work, as always. where do you find female stems? I really liked you "vintage Hamilton watch blog". It really provides interesting information about vintage watches. I really enjoyed to read it thoroughly. I am fond of Sports Flex Watches. You can also have a look on them. Hello How are you? First let me congratulate you Nice project..very professional done it. I own a Elgin 756 Movement 17 jewel germany on the dial. You would need to confirm what tap size the threaded portion of the stem is... Tap 10, 8, etc. Then any parts supply house can help you out. I have a very similar watch, with the male stem inserted and missing a female crown post and crown. However, the movement is a self-winding Hamilton 66, based on the AS 1866. You do mention in a one of your posts that most Swiss Hamilton crowns have tap 10 threading. Is that the case in the project above? Would one have to match the female crown post to that stem size, or can one get the tap 10 post as there's a very high chance the male and female parts will mate with that minute difference? ... and that might make finding and fitting a Hamilton-signed crown much easier... ? Again, thanks for the wonderful blog! Without seeing the watch it’s hard to say but I would wager that any female hub would grab the male side. The tap for the crown just has to match the hub thread and usually it’s tap 10.